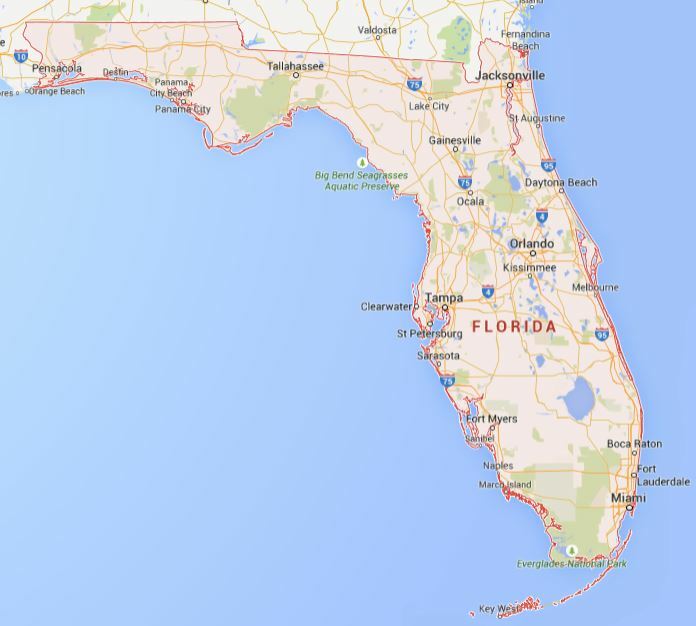 Florida is an incredibly diverse state, housing many top grossing industries our country’s economy relies on, such as 40 percent of U.S. international trades to Latin and South America, space, agriculture, construction, and entertainment. But what do all of these seemingly unrelated industries have in common? Forklift operation. Properly trained forklift drivers with a Florida forklift certification are used for a wide variety of tasks, from handling loads in a warehouse to carrying set props in Walt Disney World. 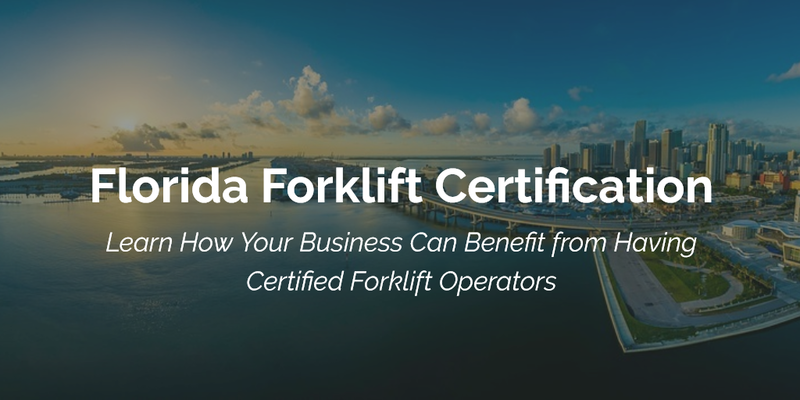 If you’re an employer in Florida who uses forklifts and forklift operators in your business, you need to get your forklift drivers trained and certified. CertifyMe.net, the leader in online OSHA training and compliance for forklift operators, will help your company become compliant in no time. Learn more below why forklift certification Florida is such a smart business move. And if you’re an employee, you should have your forklift certification in Florida. It’s not only the law of the land, but it’ll give you the best chance to land a great forklift job in the Sunshine State! For employers and employees, forklift certification in Florida is easier and more affordable than ever, thanks to CertifyMe.net! Browse our complete course catalog here, and sign up today! Forklifts and their operators have been game-changers in many different industries, for increasing speed and boosting workplace efficiency. But at the same time, these workplaces rely on properly trained drivers to safely handle materials and chemicals to increase business performance while meeting OSHA and state regulations. Nearly 25 percent of powered industrial truck accidents are ultimately linked to inadequate training as the root cause. These accidents, which include tip-overs and collisions, often lead to serious injuries and fatalities, and structural and equipment damage. As an employer, what this means for your business is increased costs, and the potential for fines and legalities The need for forklift operations to be trained and certified is very important for many reasons. By acquiring the proper training for Florida forklift certification for your employees, drivers are equipped with the tools and information they need to avoid accidents. Hiring operators without Florida forklift certification is against the law. OSHA will find out – don’t take chances and call CertifyMe.net. We’ll put together an affordable, accessible training plan for your entire forklift workforce. If you need forklift certification in Florida, CertifyMe.net will get your safety program up and running, and we’ll be your training partner for life. With renewal training, updated coursework based on OSHA regulations and more, no other Florida forklift certification training company keeps you compliant like CertifyMe.net! As an employer of forklift operators, it’s your responsibility to provide training for them and to ensure they have everything they need to work safely and efficiently. With Florida forklift certification, you can improve the productivity of your business and reduce the number of accidents that occur every year. How Can Your Business Benefit from Having Certified Forklift Operators? Forklift drivers have many reasons to want to live and work in beautiful Florida. They can benefit from a competitive market, stable job market, comfortable living with low income and property tax obligations, and, of course, enjoy the ideal weather and relaxed lifestyle. But as an employer, you may be wondering what you really get out of training employees for their forklift certification Florida? Training is worth it – for you, your employees, and everyone involved. Plus, OSHA compliance is the law. With CertifyMe.net and our forklift certification in Florida, you’ll have the peace of mind knowing your workplace is as safe as possible. Don’t let your business get involved in investigations with governmental agencies like OSHA. Stay out of investigators’ eyes and boost your bottom line with trained and certified employees. Forklift certification in Florida isn’t only good for business and for protecting employees. It’s also a requirement under OSHA standards. According to the OSHA standard 1910.178 for Powered Industrial Trucks, all employers are required to provide a safe work environment free of hazards, with trained operators who have successfully been deemed competent to drive forklifts. Only employees rewarded with a Florida forklift certification and allowed to operate forklifts legally by OSHA standards. Written and video training must include a variety of topics, ranging from operating instructions and maneuvering, to handling loads, to avoiding pedestrians and hazards. Plus, our forklift certification in Florida comes in Spanish language format, too. For states like Florida, that’s a tremendous benefit – just one of the many you’ll enjoy with CertifyMe.net! What Do Employers Need to do for Florida Forklift Certification? Now that you understand how important forklift certification in Florida is for your employees, you may still be wrestling with the idea that you’ll have to sacrifice valuable working hours to train your drivers. With many forklift certification Florida programs, this is the case. But with CertifyMe.net, you get access to the most convenient and affordable OSHA-compliant program available. Give them about one hour to complete the online portion, and other hour to do the practical evaluation with one of your Trainers. Print their operator certificates – and they’re good to go. Your Florida forklift certification is complete! The Florida forklift certification program with CertifyMe.net is completely online and can be completed on any device with an internet connection. This format makes it super easy and simple for your employees to complete the training wherever they are. Remember, you can have forklift certification in Florida (for any city in the state), and you’re qualified to operate forklifts and pallet jacks and other powered industrial trucks throughout the United States. Affordable – great prices for all of our courses. Accessible – have in internet connection? Then you’re ready to take our training! Convenient – your Florida forklift certification, on your terms. That’s the advantage with CertifyMe.net. Take your training whenever it fits your schedule. Portable – when you leave Florida, your forklift certification in Florida leaves with you. CertifyMe.net forklift OSHA training is valid in all 50 states! If you’re in one of these locations, click on the city for more information. If you’re anywhere else in Florida, that’s fine too! The course information is the same, and will get your employees the quality, comprehensive information they need to operate forklifts safely and properly with their forklift certification Florida. Don’t wait to boost your business with certified employees. Create an account today and get your drivers their Florida forklift certification! CertifyMe.net is here to help with all of your Florida forklift certification needs – give us a call today at 1-888-699-4800.